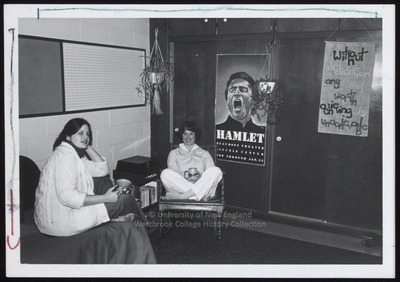 "Carol Ann Campbell and Sally Marshall Stearns, Westbrook College, Clas"
Westbrook College students Carol Ann Campbell and Sally Marshall Stearns, Class of 1978, lived in McDougall Hall. Carol Ann was a Nursing major; for her senior class candid photo, which appeared in the 1978 Tower Yearbook, she wore a light colored, cable knit cardigan sweater over blue jeans. Her hair was long and parted in the middle. Sally was a Dental Hygiene major; for her senior class candid photo, she wore a long sleeve, pale jersey over her DH slacks & blouse uniform. Her dark hair was short and parted on the side. The young women sit on the bed and a chair in their McDougall Hall dormitory room. They hold large coffee mugs. On the dormitory wall are posters and hanging plants.